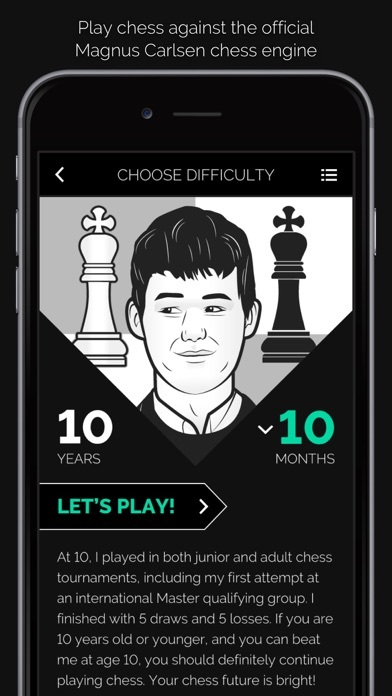 Magnus Trainer" - Learn and Play Chess with Magnus Carlsen! Re: Magnus Trainer" - Learn and Play Chess with Magnus Carlsen! Thanks very much for this. Do you also have Play Magnus app premium version ? chesslike458 wrote: Thanks very much for this. Do you also have Play Magnus app premium version ? Overview: Play chess online with millions of players around the world! Enjoy free unlimited games and improve your chess rating with 50,000+ tactics puzzles, interactive lessons and videos, and a powerful computer opponent. Unlock your inner chess master today! Added workaround for old devices (pre Android L, so Android 4.4.4 and older) to fix connection errors. Please note that those devices are no longer supported by Google and are less secure then newer versions.